On Saturday February 16, 2019 at a press conference, Aurora Police Department, led by Police Chief Kristen Ziman released additional details about the shooter and the active shooter incident on Friday February 15, 2019. All five Aurora police officers are recovering in hospitals in the Chicago metropolitan area. None of their injuries are believed to be life-threatening. “Officer 1” Male, age 39 with 13 years service with the Aurora Police Department, suffered a gunshot wound to his lower extremity and was described as “stable” at a local hospital. “Officer 2” Male, age 52, with 25 years of service with the Aurora Police Department, suffered a gunshot wound to an upper extremity, was treated and will be released from a local hospital later Saturday morning. “Officer 3” Male, age 52, with 24 years of service with the Aurora Police Department, suffered a gunshot wound to a lower extremity and was treated and released from a hospital yesterday. “Officer 4” Male, age 53, with 30 years of service with the Aurora Police Department, suffered a gunshot wound to a lower extremity and was treated and released from a hospital yesterday. “Officer 5” Male, age 24, with just under 4 years of service with the Aurora Police Department, suffered a series of shrapnel wounds to an upper extremity. He is currently being treated and is described as “stable” at a local hospital. “Officer 6” Male, age 23, with 2 years of service with the Aurora Police Department suffered a minor injury not related to gunfire. A sixth employee shooting victim was a male employee of Henry Pratt, and was treated at an area hospital for non-life-threatening gunshot wounds sustained during the shooting incident. Aurora police released the identities of the five deceased victims who worked as Henry Pratt. Clayton Parks, of Elgin Illinois. Mr. Parks was the Human Resources Manager at Henry Pratt. Preliminary investigation indicates that the deceased victims were located in the same general area of the Henry Pratt facility. While this investigation is ongoing, Aurora police said they believe that there was only one assailant. Police Chief Kristen Zimat then released information about the shooter. Gary Montez Martin was 45 years of age and lived in the block of 1900 Selmarten Road, Aurora. Gary Montez Martin had six prior arrests by the Aurora Police Department, including arrests for traffic and domestic violence related issues. His last arrest in Aurora was in 2008 for violating an order of protection. Gary Montez Martin’s most recent arrest was in 2017 by the Oswego, Illinois Police Department for Disorderly Conduct and Criminal Damage to Property. Gary Martin, Aurora Active Shooter, deceased SOURCE: Aurora Police Department. • January, 2014 the shooter was issued an Illinois Firearm Owner’s Identification (FOID) Card. • On March 6, 2014, the shooter applied to purchase a handgun from a local gun dealer in Aurora. • On March 11, 2014, the shooter took possession of a Smith and Wesson 40 caliber handgun from that same local dealer. 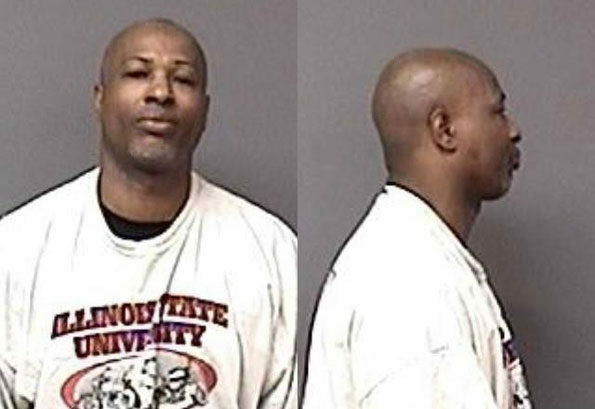 • Once this felony conviction was discovered, the offender’s concealed carry permit was rejected, and his FOID card was revoked by the Illinois State Police. Any weapons he had should have been relinquished, and police are investigating why his weapon was not relinquished. The shooter was found a .40 caliber firearm inside the plant and several spent magazines were found. Police confirmed there was a laser on the gun. The ATF reported the firearms are traced from the manufacturer to the distributor to the firearm licensee to the first purchaser, and to the final person who possesses the firearm, if necessary. Aurora Police Department next outlined the resources used during the Active Shooter Incident and the timeline for the resources. 8 contact teams to search the plant wit 6-8 officers each . 1:24 p.m. Initial call of an active shooter in the plant at 641 Archer Avenue. 1:24 p.m. Second 9-1-1 call reports shots being fired as an employ was being terminated. 1:25 p.m. Call reporting two shots fired in the warehouse; also shots were overheard over the phone. 1:26 p.m. More shots fired. 1:27 p.m. More shots fired. 1:28 p.m. First police officer on scene, and a determination was made to activate the Special Response Team. 1:30 First report of a police officer shot. 1:31 p.m. Indication of a victim in the bay. The five victims were immediately determined to be deceased. 1:31 p.m. Bearcat (armored vehicle) breached the facility to rescue wounded officers and victims in the plant. Employees that were sheltered in place were also rescued. 1:32 p.m. More shots fired and second officer reported being shot. 1:33 p.m. More shots fired; some shots from police officers. 1:37 to 1:52 p.m. Working to extract wound police officers from the scene. 1:52 p.m. to 2:58 p.m. No contact was made between police and the shooter. 2:58 p.m. Police contact made with shooter in a back machine shop are that at the furthest point from where the police entered the 29,000 square foot warehouse. 2:59 p.m. Confirmation that the shooter had been neutralized. CBS Chicago: In a press conference Saturday morning, Aurora Police Chief Kristen Ziman identified the five victims who died after gunman Gary Martin, 45, opened fire inside Henry Pratt manufacturing plant Friday.